Need a new easy to make weeknight dish? These flavorful Instant Pot Chicken Thighs are your answer! 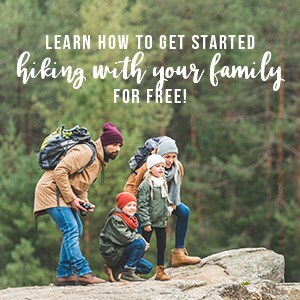 Plus get a bonus recipe for the leftovers! Lately we’ve been struggling with our weeknight meals. Generally either one of two things happen. We’re too tired to make anything that requires much effort, or we’re just bored with the same old, same old. Chicken thighs are currently one of my favorite things to make because of how versatile and flavorful they are. We’re also trying to change up the cuisine in our house to get out of the food rut we’ve been in. One of the cuisines I’ve always loved is Thai cuisine. For me, it’s is all about a delicate balance of flavors. I love the blends of sweet and sour that help balance out the spiciness that I generally expect from Thai dishes. 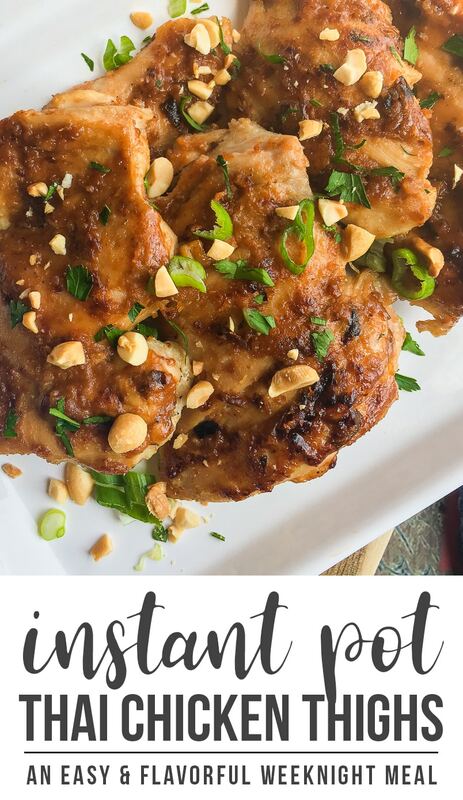 Luckily, I’ve found a chicken thigh recipe combines these perfectly: Thai Inspired Instant Pot Chicken Thighs. No crazy, use only once ingredients? Check. These flavorful chicken thighs are the perfect weeknight dish. Not only that, but this Instant Pot chicken thigh recipe yields leftovers that are great for shredded chicken! Add the sesame oil to the Instant Pot and set the Sauté setting to high. Brown the chicken thighs in batches in the sesame oil, approximately 3-4 minutes per side. Repeat this process until all chicken thigh sides have been browned. Remove and set aside. Add the chicken broth and gently scrape up the brown bits. Add in the peanut butter and stir until melted. Add in the soy sauce, lime juice, honey, Sriracha sauce, fresh ginger, garlic powder, salt and pepper. Stir until thoroughly combined. Add the Instant Pot trivet to the Instant Pot and place the browned chicken thighs on top. OPTIONAL: For a thicker sauce, select the sauté setting and heat, stirring often, until the excess liquid is reduced. Once the sauce has reached your desired consistency, turn off the Instant pot and return the chicken thighs along with the juices that are on the platter to the Instant Pot. Turn to coat evenly. When finished, do a quick release to allow the pressure to release. When finished, unlock and carefully remove the lid and transfer chicken to a platter. Top with cilantro, peanuts, and green onions. Serve with extra peanut sauce. Want to get the nice browning shown? After you're done cooking these Thai chicken thighs, transfer them to a large rimmed baking sheet that's been lined with aluminum foil. Brush each side with more peanut sauce and broil on high for a few minutes or until it's nicely brown. A note on the sauce: I love my peanut butter sauces with Thai food so I’m always tempted to add more peanut butter. But if you add more and the sauce is too thick, the Instant Pot may not be able to reach the necessary pressure. 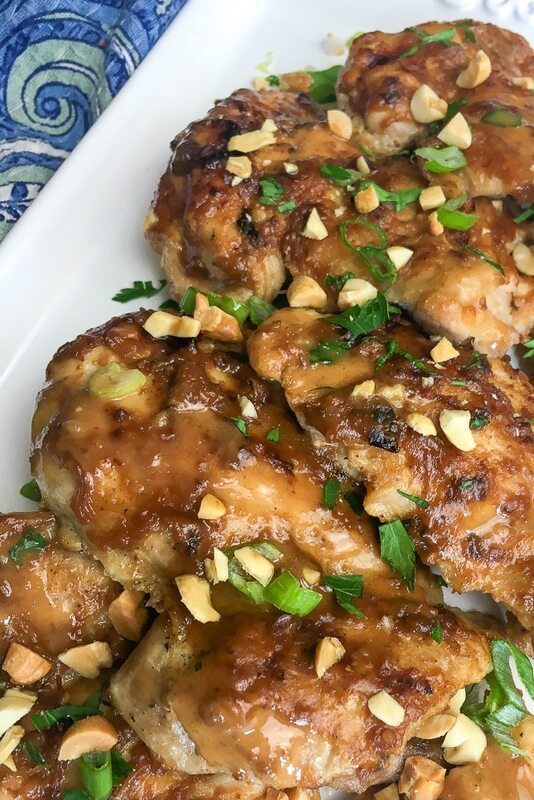 If you add more peanut butter to the thai chicken thighs recipe, be sure to add in more liquid to compensate! 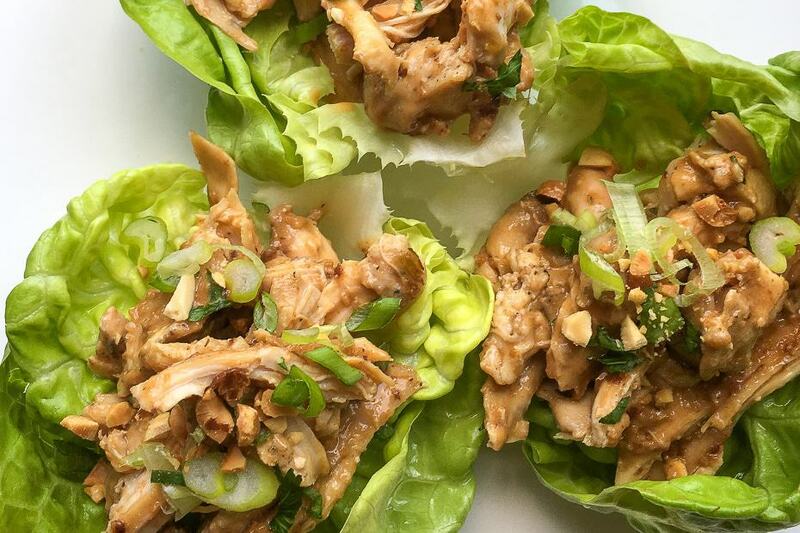 Remember how I mentioned that these Instant Pot chicken thighs make great leftovers for lettuce wraps? Not only is this another delicious dish, but it’s SO easy. You don’t even need another recipe because it’s just adding in some lettuce. All you need to do is shred the chicken, add it to the lettuce, and, if you have extra sauce, drizzle it over the chicken. Top with the same garnishes if you want and enjoy! It’s a great way to use up any leftover chicken thighs, but it’s also an easy lunch for the next day. 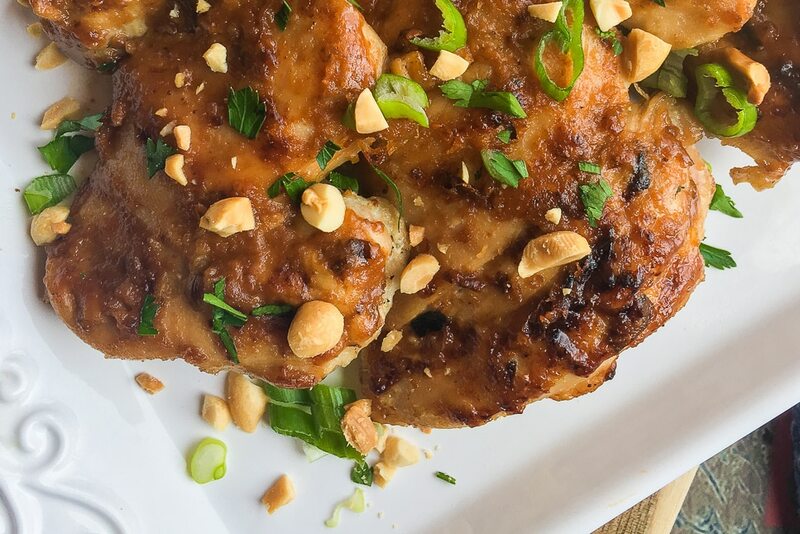 Plus, it’s a delicious new way to enjoy the thai chicken thighs recipe. And if you’re looking for more easy Instant Pot recipes, try this Instant Pot Rice Pudding recipe, this Instant Pot Baby Back Ribs Recipe, Instant Pot Loaded Low Carb Cauliflower Soup, or you can make Instant Pot Iced Tea. 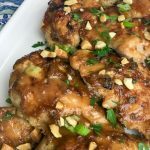 If you found this thai chicken thighs recipe helpful, I would greatly appreciate you sharing this on Pinterest! Thanks for the question! I don’t see why not. We haven’t made it this way, but I think you may just need to increase the cooking time a little bit.